While at the Swinetastic BBQ Festival, a KCBS Competition in Frederick, MD on June 17-18, 2011, I happened upon a couple of Maryland-based BBQ sauce companies. John Layton of Red Brothers was participating in the Backyard Competition while his brother Chris manned their vendor’s booth. After tasting 2 of their 3 BBQ Sauces, I decided to purchase the hottest of the offerings, their Fiery Habanero All Natural BBQ sauce. Based on an 80 year old family recipe from their Grandma D (a great family story, BTW), I persuaded Brian to try this on wings this weekend. Although neither of us prefer a hot BBQ sauce, we decided to give it a go, based on the flavor profile, and the fact that it may make for some great “hot” wings. 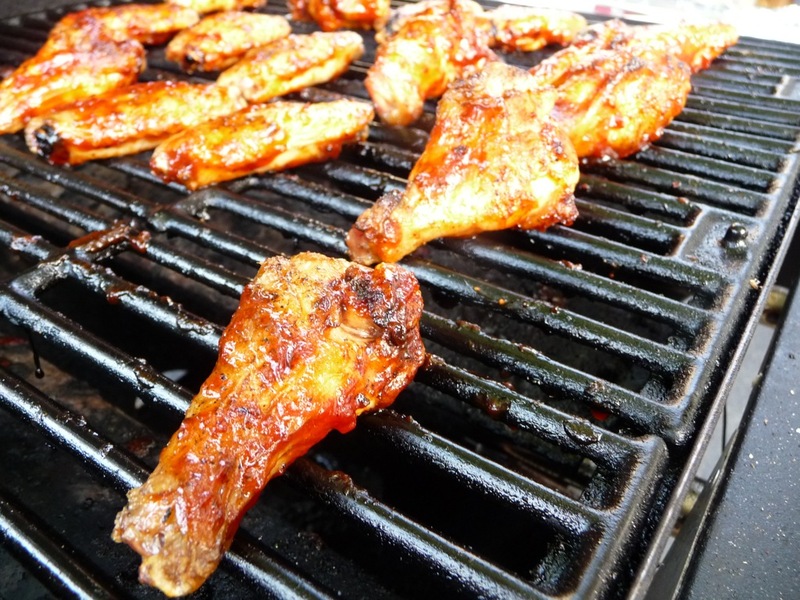 Brian smoked 16 wings over hickory on our grill, and cooked them to perfection, before applying the sauce. Texture & Appearance: – This sauce has a lovely deep red color, with soft bits of onion and horseradish, perfect for a glaze on any meat. It’s not so thin that it separates, and it clings very well to the spoon. Taste Straight Up: – This is a mildly sweet and sticky sauce, with a lot of heat that comes on very quickly. The combination of ingredients results in a very smooth, warm flavor. I anticipate that cooking this will really caramelize on the meat due to the sugar content. It’s very silky, but not slick on the tongue, and the habanero kicks in and ramps up as you try more (and more, and more). Heat Level: – Wow, this really warms the mouth, with a very pleasant heat that fills your mouth. I like it!! Label/Graphics: – Very well done. The black background with a large rustic “R” grabs your attention right away. 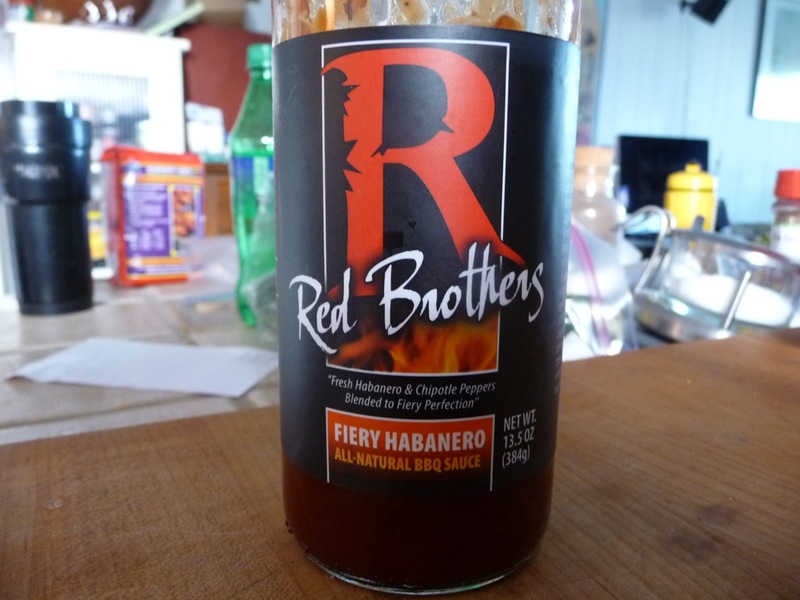 “Red Brothers” in a predominant white script underlined by flames lets you know who the company is, and the descriptor “Fiery Habanero” is easily read. This is an all-natural sauce, and the subtitle “Fresh Habaneros & Chipotle Peppers” provides more info, although, I could not detect the chipotle aspect at all. Overall Rating (Taste on Food, Final Impression): – Though we have said repeatedly that we don’t really prefer a hot BBQ sauce, on wings this was a winner. Brian said, “It’s sweet and sticky, and if you like heat in your BBQ sauce, this is one of the best I’ve ever had.” Quite a compliment from him! He gives it a 4.0 overall, but I have to trump him and give it 5 stars. We look forward to trying Red Brothers Original and Spicy BBQ Sauces, and will bring you our reviews as soon as we receive them. UPDATE: I just found out that John Layton and Red Brothers BBQ won the backyard competition at Swinetastic 2011 with their ribs! We’ll be seeing them on the KCBS circuit from now on. Good luck, John and crew! We’ll soon see you on the road!! Their sauces are available online at RedBrothersBBQ.com. I suggest you buy them! tomato sauce, sugar, organic soy sauce (water, organic soybeans, salt, organic alcohol to preserve freshness, fresh onion, worcestershire sauce (distilled vinegar, molasses, corn syrup, water, salt, caramel color, sugar, spices, anchovies, natural flavor and tamarind), mustard flour, lemon juice, fresh horseradish, crushed red chilies, habanero sauce (orange juice, habaneros, chipotle peppers, water, natural pepper flavoring, tomato paste, spices), herbs and spices, salt. We really enjoyed this sauce on the wings. I’m not usually a fan of heat in my BBQ sauce, I prefer to keep that in the hot sauce world, but this was remarkably delicious. Thanks for the great review! The Swinetastic BBQ Festival was our first try at a Backyard BBQ Competition – we are thrilled to have won first place, and in addition, to receive such a fantastic review from you. Tasting the sauces at our vendor booth never does them justice, as they need the heat of the grill to really bloom, so we appreciate the time you took to check out our product and look forward to your take on our Original Sweet and Premium Spicy sauces. John and Chris, if you look at our previous posts, you’ll see how nearly impossible it is to get 5 stars overall. But congrats, you’ve done what others haven’t! I had your sauce straight up on grilled burgers last night, and loved every bite. Thanks for making Maryland proud, a great accomplishment! Congratulations to the fabulous Red Brothers on their phenomenal BBQ Sauces! 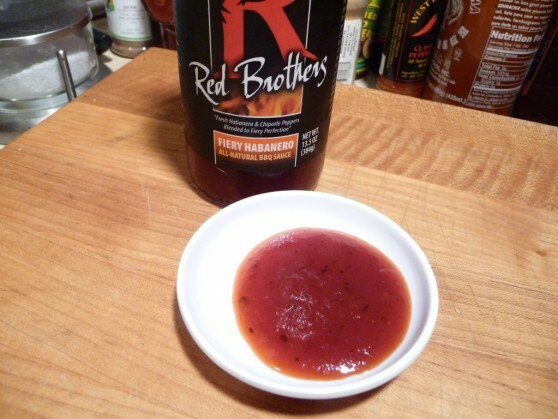 The Red Brothers BBQ Sauces are one of our favorites to manufacture… truly delectable sauces! We are thrilled to see their success! Hi Nila, thanks for the nice comment about the Red Brothers’ products. Marilyn and I would love to tour your facility someday. Oh and we’ll look for you at the Fancy Foods Show this weekend. Nila, you have made possible the success of a lot of local small manufacturers here in Maryland, as well as supporting those who have gone on to be major players in the sauce world. It was a pleasure to finally meet you in person at the NASFT show in DC last weekend! 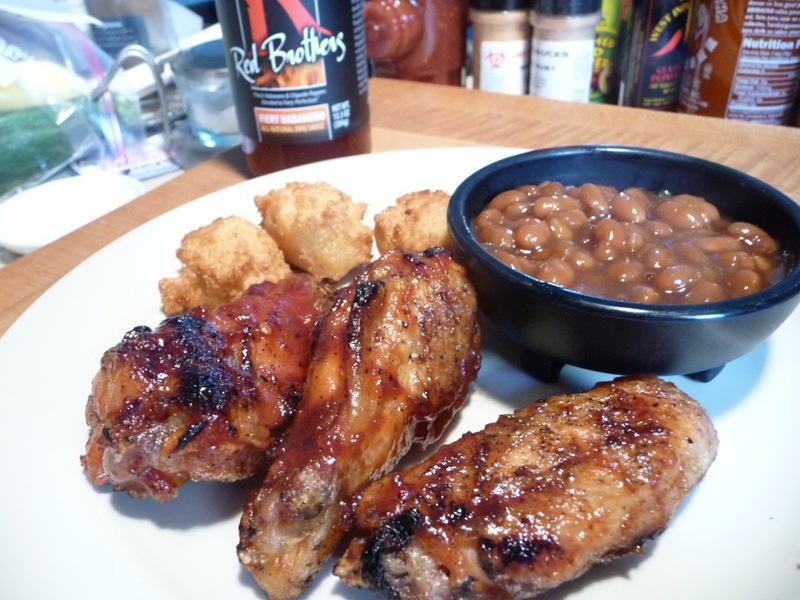 We’ve been huge fans of Red Brothers BBQ since it was John’s evil secret to support fabulous backyard picnics. We use it for boy scout fundraisers and girl scout money earners, and it is not only fabulous sauce, but from the nicest people you could possibly meet. Red Brother’s sauces are AWESOME, we purchase it by the case for our office and it goes great with everything. We hand out free bottles to our clients because the BBQ sauce should be shared with the world. Everyone one who has received a bottle from us has come back and told us how much they love it. Even picky kids like it on their food. Red Brother’s offer’s a corporate package of three bottles in a nice white box which makes great presents for business clients and family. The sauce can be purchased from their website or at local stores in Carroll County. You really need to try this sauce if you haven’t, because once you do you will be hooked. Hey Diane thanks for the comment and support! We love to hear from real folks that have actually tried the sauces we review. Also, we just received their other two flavors for review so stay tuned for them. Awesome sauce, awesome people. It is so nice to see that others are taking notice and validating what I have always known. Ed, you know a good sauce when you taste it! Thanks so much for contributing to this post! I am a huge fan of Red brothers sauce’s they have ruined me for my local sauces, (Omaha, Nebraska). I just cant enjoy them anymore!! I even add the sweet to my baked beans for a secret ingredient that my friends rave about! Yummy!! the best I have ever had! Premium spicy is my favorite! Sheryl, how did you ever come across these sauces in Nebraska? However that happened, good for you! These are some of the best BBQ sauces I’ve ever encountered! I’m gonna have to give these a try! Sounds really good.